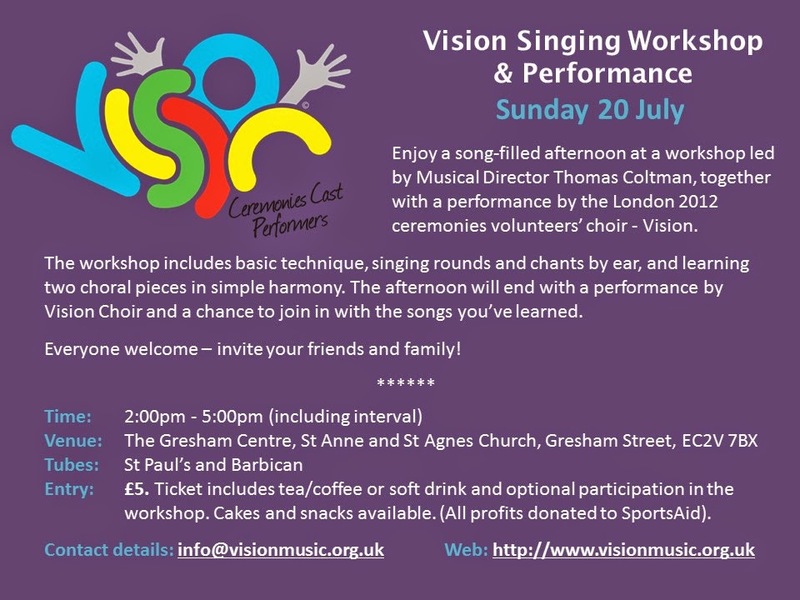 The London 2012 ceremonies volunteers’ choir Vision warmly invites you to join them on Sunday 20th July for a choir workshop led by their Musical Director Tom Coltman at The Gresham Centre, St Anne and St Agnes Church, Gresham Street, EC2V 7BX from 2-5pm - entry £5. Tom is an accomplished bass-baritone, vocal coach and pianist and is also Musical Director for the Diversity Choir, Choral Leader at Morley College and the Director of Voice at the European Youth Summer Music Programme. The workshop includes basic technique, singing rounds and chants by ear, and learning two choral pieces in simple harmony. The afternoon will end with a performance by Vision Choir and a chance to join in with the songs you’ve learned. All profits from the day will be donated to SportsAid to help benefit the athletes of the future. £5 entry includes free tea, coffee, or soft drink and optional participation in the workshop. Snacks and home-made cakes available. Visit our Eventbrite page to purchase tickets.